When you think of a smartwatch you think of an extension of your mobile phone, an extra screen on your wrist that you can use to control the computer in your pocket. 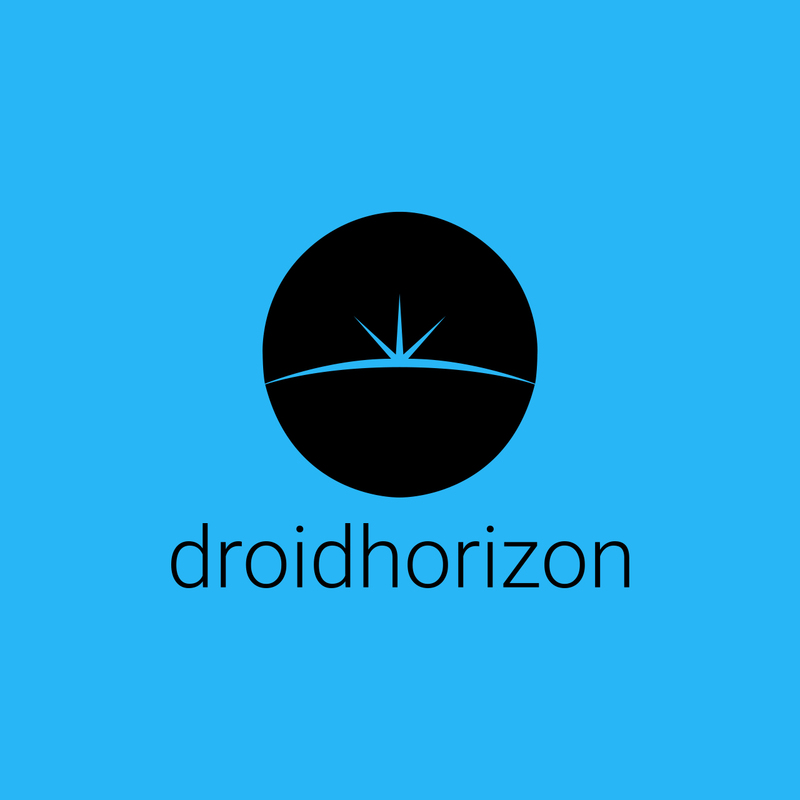 A high resolution companion with access to all the apps and functions you have at your disposal. Elephone have taken a different route with their W2 device, instead choosing to follow first generation devices like Martian. 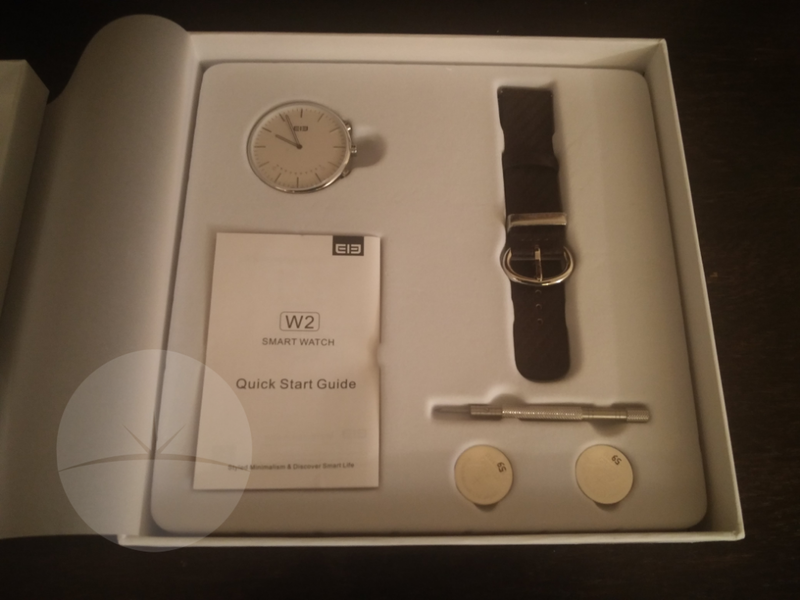 The W2 is an analogue connected watch. A semi-smart watch if you will. 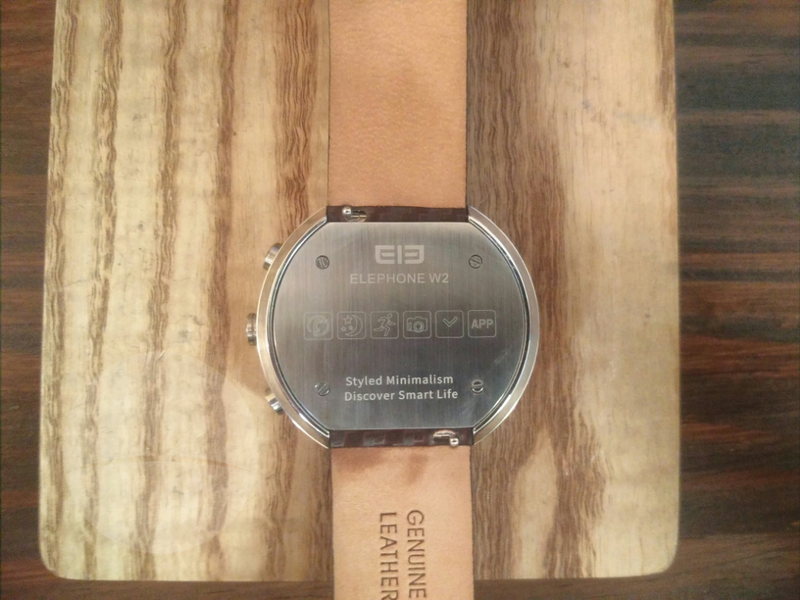 Elephone have made an effort with the W2 packaging. For a budget unit I was surprised and impressed when mine arrived. 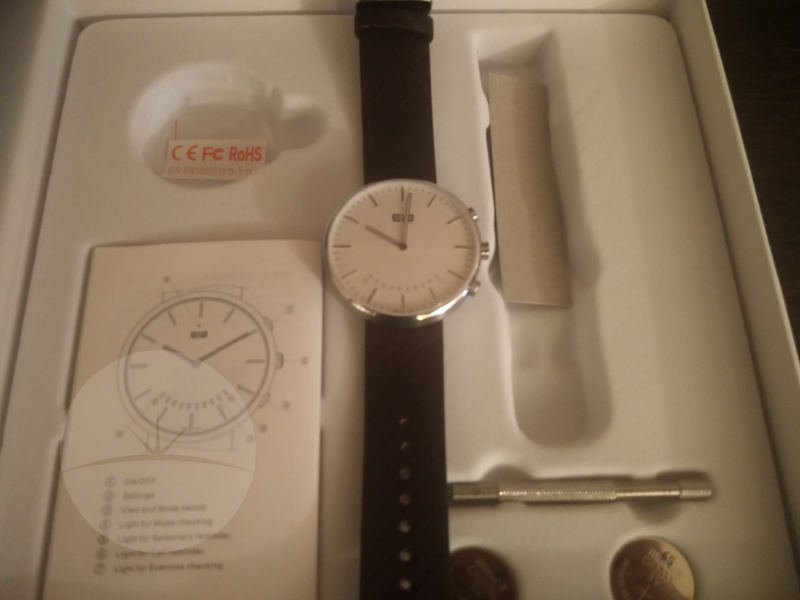 The box itself contains a quick start guide, the watch dial, leather strap, small screw driver and two spare batteries. As you can see you need to attach the strap yourself before you can wear it. The W2 has a very simple, almost elegant style. A round dial attached to a leather strap without fuss in a choice of either ‘Champagne Gold’ or ‘Classical Silver’ watch faces with an almost walnut coloured band, although a lighter ‘Khaki’ band is available for purchase as well. I have the Classic Silver which has a very industrial look and feel to it, with flat edges and slight chamfers, while the Champagne Gold has a more rounded and curved look. 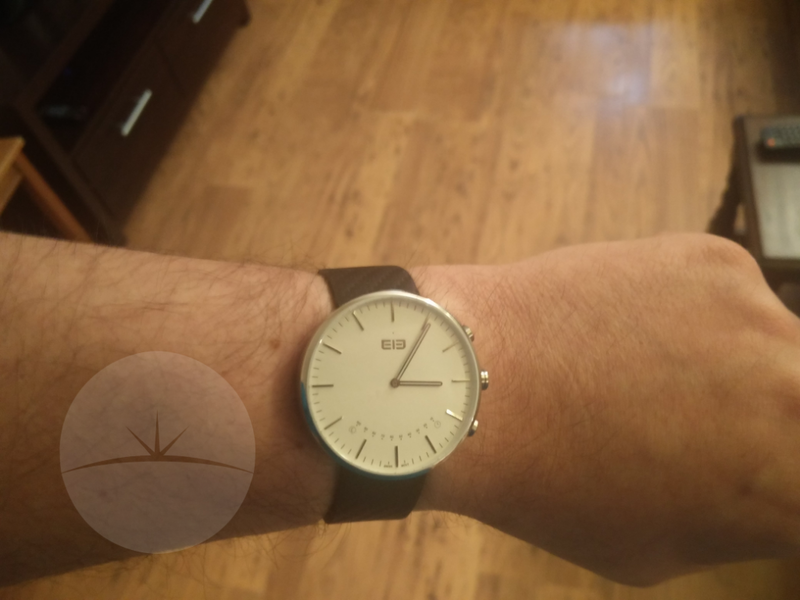 The dial suffers the same downfall of all smartwatches right now in my opinion, in that it is a lot thicker than you expect from a normal watch. In some ways the thickness actually adds to the industrial styling of the silver model with the solid machined outside surface. 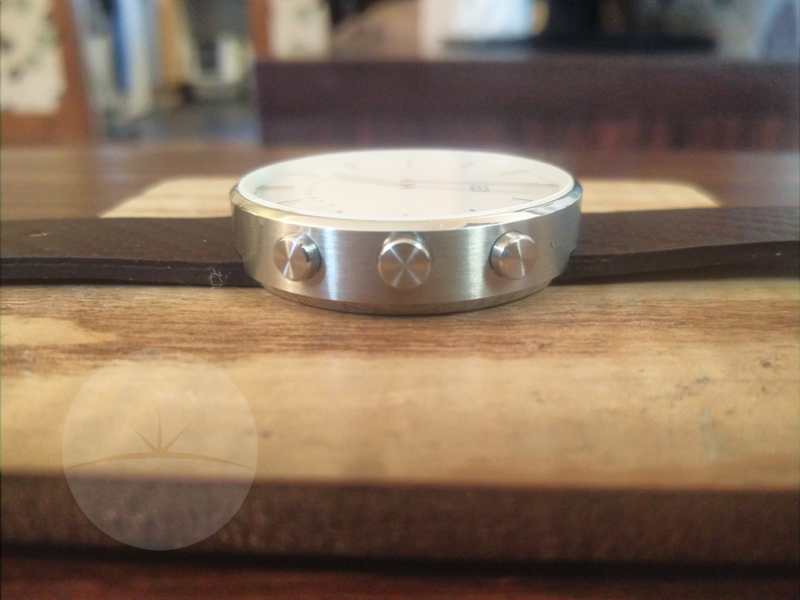 The watchface is again very simple and plain in look with the notification LED holes being pin prick in size, at a glance you would never know this was a connected device. The watch is water resistant to 30M, so should be safe for most uses during your daily routine. On the right hand side of the watch (yeah, watches are for your left wrist) are three proud buttons for setting the time and using the smart functions. The buttons feel incredibly well manufactured, with a solid click when used. 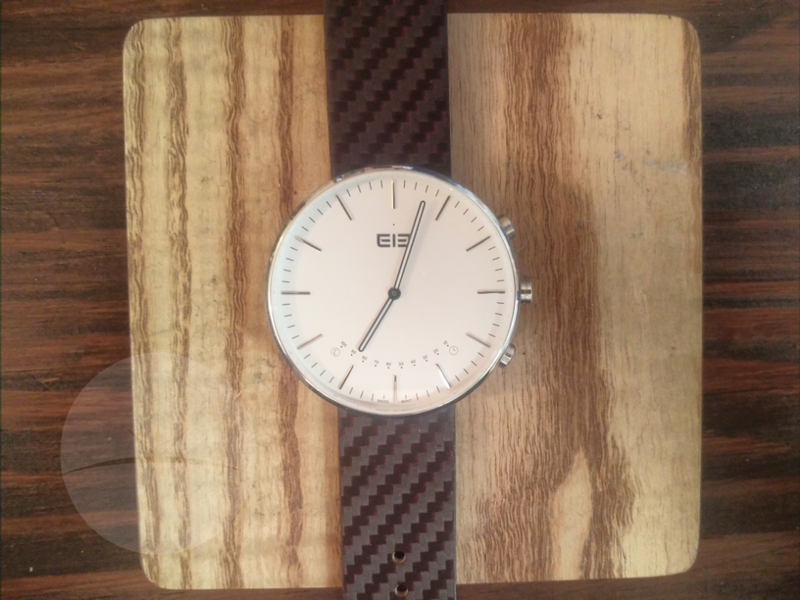 The strap is a deep brown leather with a diagonal hatching pattern and is standard watch width making changing it a breeze. The included strap even has little grips on the spring loaded pins for easy removal and insertion. As I said earlier, I look upon the W2 as a semi-smartwatch. The time is covered by a Ronda powered analogue movement which is battery driven. This means that the connected functions are a call notification, activity, sleep tracker, multiple alarms and remote camera control. 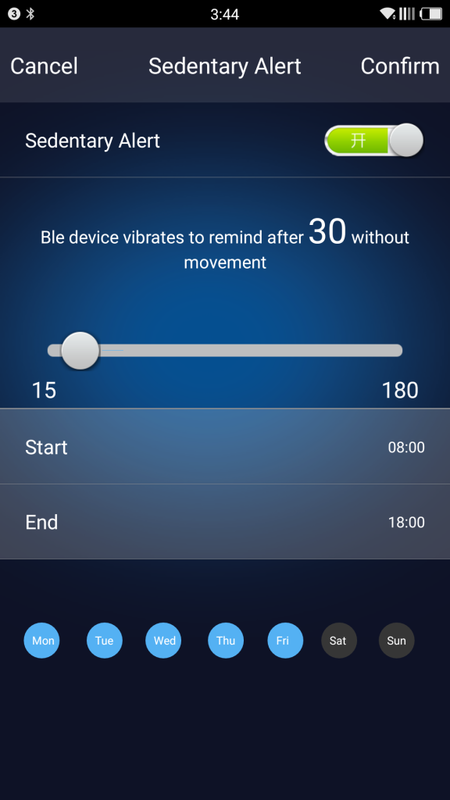 Call notification is done via vibration and visually with the leftmost activity LED. It’s a simple notification without detail of who is calling. This is currently the only phone notification that you receive, but Elephone could decide to add more with firmware and app updates in the future. 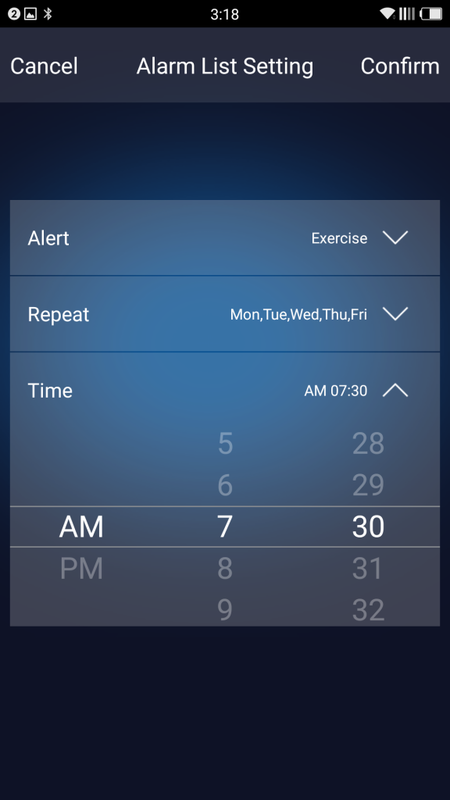 Alarms are set using the phone app (Android and iOS) and can be set to repeat over your choice of days, however there is a limit of three alarms that you can set. Remote camera control is perhaps a weird inclusion. It allows you to use the watch buttons as a shutter control, for a built in camera in the Elephone app, rather than on your phone’s native camera. It works as it should, but I can’t help thinking that it is a little bit pointless with very limited use cases. The main smart feature is the activity tracker. For the time I have used the watch I have been impressed with the level of accuracy. 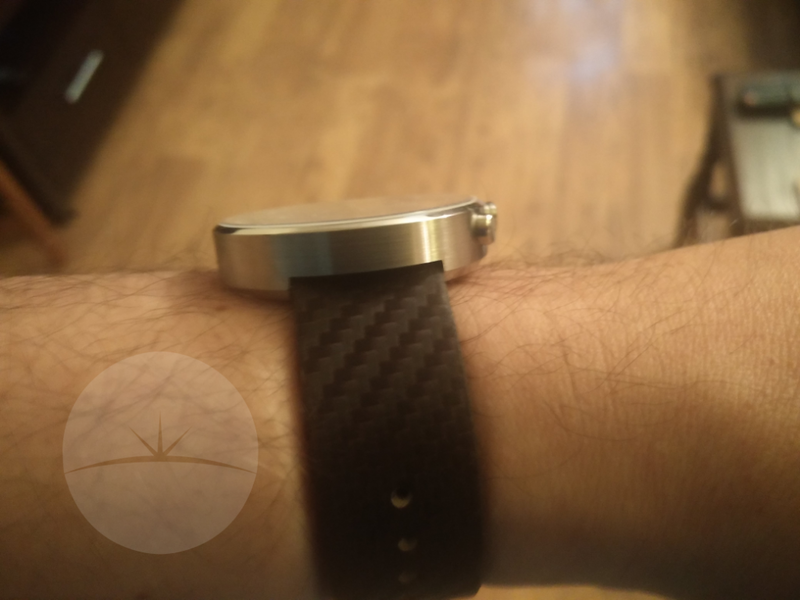 This is the feature customers will buy the watch for and they have integrated it very well. If you don’t fancy the standard thick rubber band or even just don’t like the idea of having to wear something else round your wrist, this is the kind of device that will catch your eye. There are ten small LED’s that curve with the bottom of the watch face, and by pressing the check button, they will light up so far to show what percentage of your daily step total you have reached. It’s a nice little animation and is clear in showing how well you are doing. 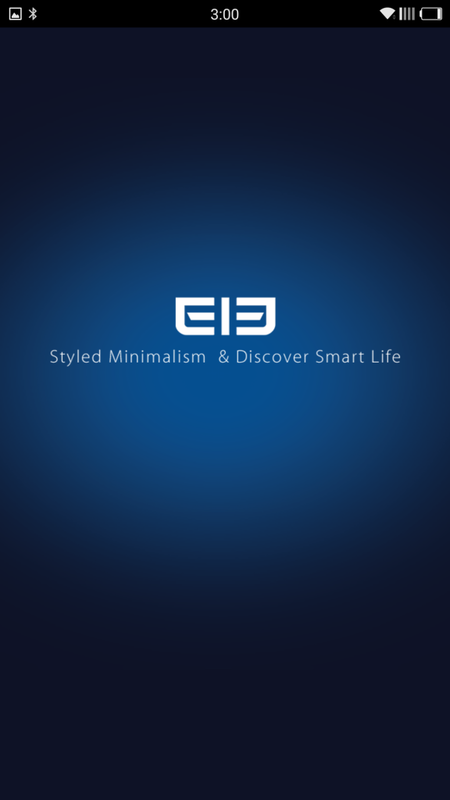 A connected device is only as good as the connection it has and the information it displays, and happily the Elephone W2 phone app (Android) is a pretty well written piece of software. 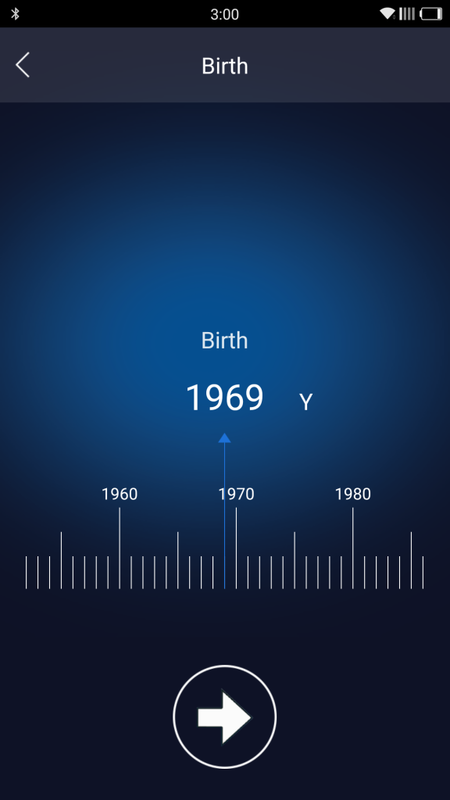 On first use the app asks for some basic information – Height, weight, age and gender, plus a daily step target which it uses to calculate some of the information it presents to you. 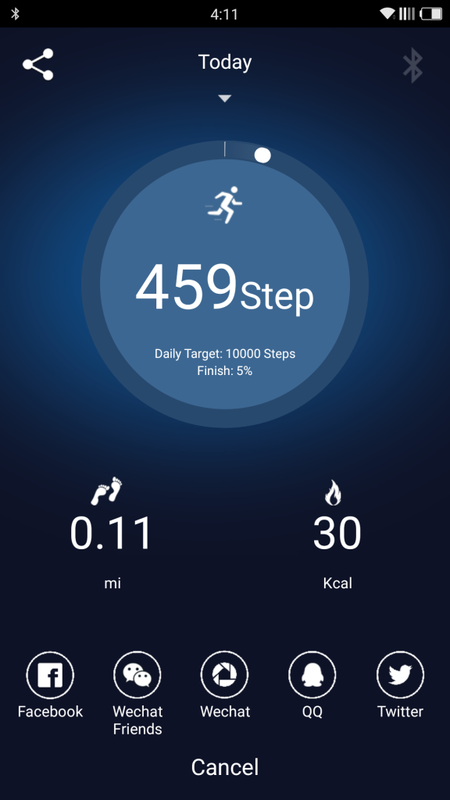 Once the main screen has loaded you have a large circle which counts round as you step towards your step goal. This information is also displayed in miles walked, and calories burned. 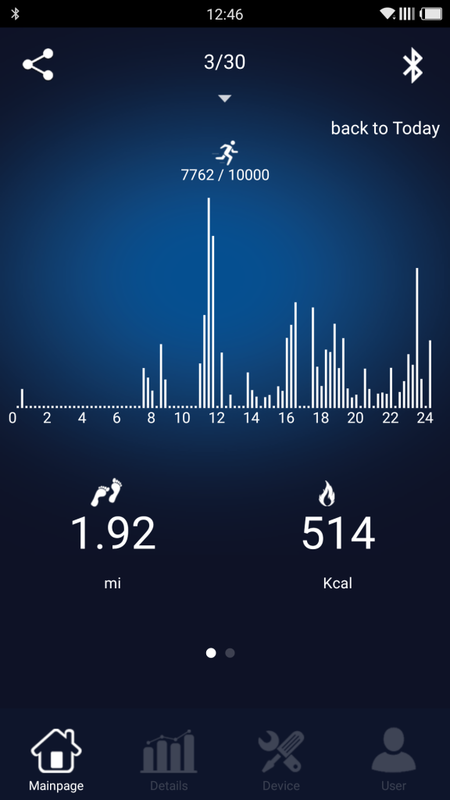 You can look back upon previous days exercise and also a breakdown of when you were most active during the day. 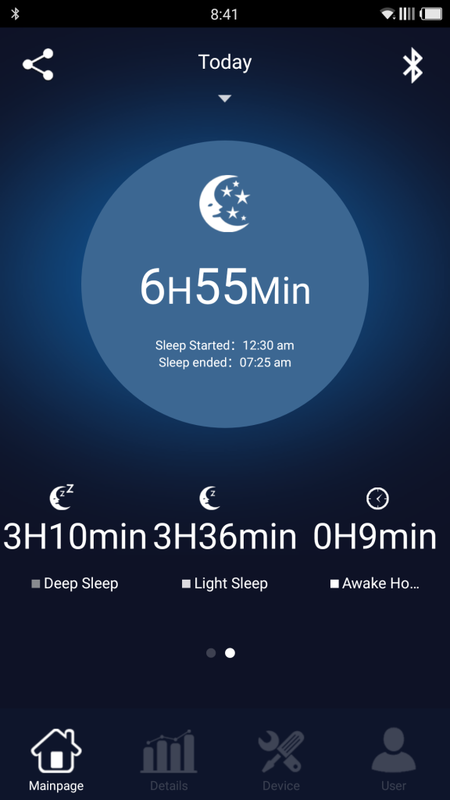 Swiping to the left shows another similar screen which has information on your sleep pattern, with deep sleep, light sleep and awake totals with an hourly breakdown available as well. The UI is nice and uncluttered with simple animations when changing the display information. 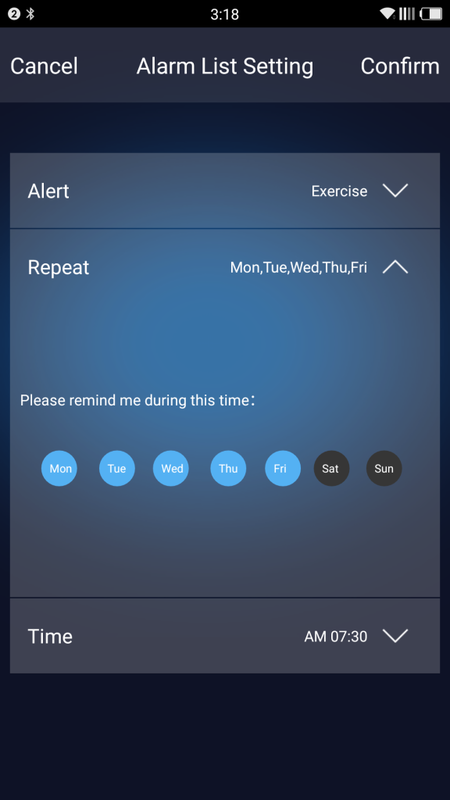 Longer term information can be seen in the details tab which has custom views for weekly, monthly and yearly data for both activity and sleep patterns, useful if you are planning on using the activity functions to help motivate exercise or improve sleep quality. 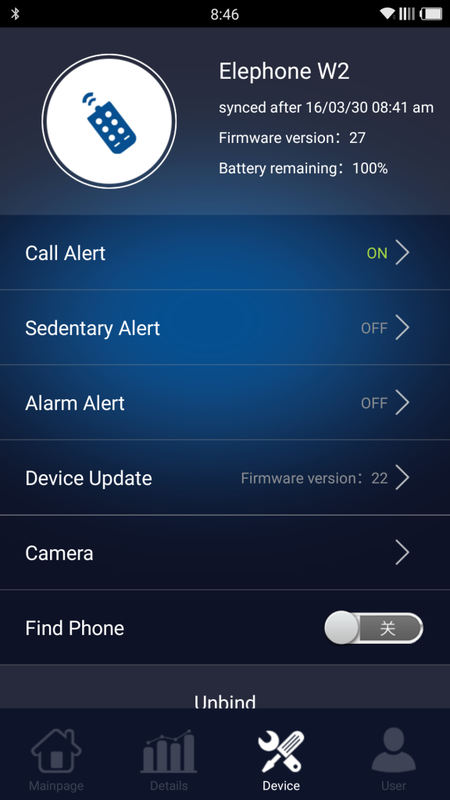 The device tab is where you turn call notifications on and off, setup alarms and enter the remote camera mode. 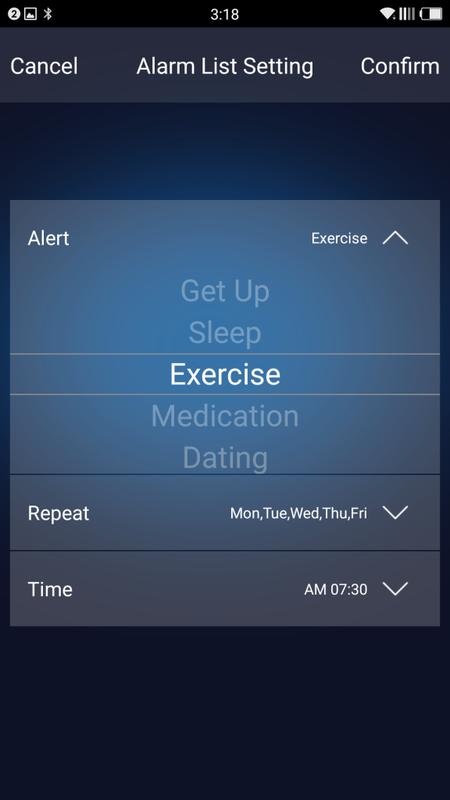 There is also a sedentary alarm which is used if you are in the one place for too long. Basically you set a time limit, 30 minutes for example, and start and stop times, and the device will vibrate if you have not walked around for the set time during the time limits. I guess this could be useful for those who work sitting down as a little nudge to get up and move for a bit. Finally there is a ‘Find Phone’ slider, and to be perfectly honest, I have no idea what it does. I have searched everywhere but can’t find any information about it. The battery in the W2 lasts considerably longer than the one or two day usual of smartwatches, it even destroys the month a MiBand will last by promising up to three months of use. This is just as well as the W2 doesn’t have a rechargeable battery. Remember those two spare batteries and screwdriver in the box? Well those are your next two replacement batteries and the means to changing them. On the back of the watch four little screws hold the backplate on and you need to remove these to change the battery. The batteries are standard flat CR2032 batteries that should be simple enough to pick up once you have worked your way through the first three. The mode LED on the watch face will glow red when the fitted battery is nearing it’s end of life giving you plenty notice to change it. The W2 isn’t for everyone with it’s limited smart functions, but then judging by sales of activity trackers against full blown smart watches, maybe it is placed in the bigger part of the market. It looks great and does what it does very well. Because of the real analogue watchface you won’t get asked if it’s an Apple watch about 20 times a day either, which can only be a good thing. Before my W2 arrived I wasn’t really sure if I would like it, but so far I have been nothing but impressed. If you are in the market for an activity tracker that doesn’t make you look like an overweight (I’m guessing that bit) wannabe decathlete, and fancy something a lot more subtle, this is well worth a look. The W2 can be picked up for £59.99 on Amazon, although I did see it listed for as low as £35.10 on some lesser know sites. At £60 you really can’t go wrong with a W2 as a daily watch if you don’t want the full blown smartwatch experience.